A book I’ve been delving into (see Sources) and an article I’m composing myself both use the terms translation and adaptation. This obliges me to consider what the differences are between the two terms. At a superficial level, it can be treated as a matter of English collocation. We generally see, for example, stage adaptation (or version, which is a synonym of adaptation) or screen adaptation, often without a change of language, rather than stage translation or screen translation. (I myself once acted in a stage adaptation of Pride and Prejudice!) But of course there’s more behind the words. An enduring example of genre adaptation is Charles and Mary Lamb’s Tales from Shakespeare, written in 1807 and still in print in several editions (see Sources). It came to be regarded as a work of literature in itself, but of children’s literature. However there’s still more that’s important, and the most important of all is that the concept of adaptation allows for changes in the content and style of the original that would be unacceptable in a translation; in other words for a much wider difference between the two that goes beyond the wording, and hence for a far more radical and unchained intervention by the translator/adapters. A glaring example of this is the adaptation of Aladdin for the British Christmas theatre For over two hundred years now, since 1788, Antoine Galland’s original French text (itself a translation from Arabic) has been variously translated and adapted for the stage, modern music and topical jokes added, transgender dressing introduced, etc. The pantomime is a mishmash parody of the original Middle Eastern folk tale. Yet all his many borrowings from French, Italian, etc. are adaptations in the modern sense. Indeed Chaucer often combined several sources in his re-tellings. Not that the concept of close translation didn’t exist; but in Bible translation or legal documents, not literature. For his sake and for the sake of other adapters, we hope God forgave him. Brunilda Reichmann Lemos (Universidade Federal do Paraná). Some differences between Boccaccio’s and Chaucer’s Tales of Griselda. No date. 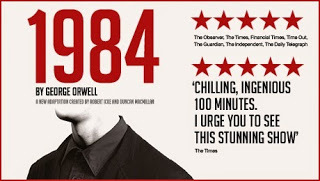 A stage adaptation from Orwell. Source: http://www.exurbe.com.